Take soft rock, give it both fast and slow tempos, mix in an intriguing voice with impressive lyrics, and get Jason Mraz’s newest album, an album that aims to deliver a musical experience you wont soon forget. The music has an almost hip-hop and reggae like trait buried underneath the consistent rock melody. Mraz sounds very similar to Freddie Mercury (Queen) during songs like “Absolutely Zero”, almost causing a double check of the album cover to see if Freddie was really in there. His voice is smooth and uplifting, and his guitar playing is overflowing with talent. Those looking for the next Dave Matthews should look no further. The unique fusion of many different genres creates a sound that identifies Mraz instantly. His music is poetry, being deep, moody, and witty all at the same time. The music is very real, very personal, and not about money and women like 90% of music today. It becomes emotional and grabs you in based on its purity and form. 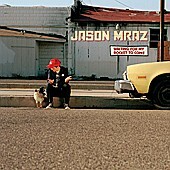 Just like Dredg, Jason Mraz provides a musical experience that is purely original and has yet to be copied. Mraz’s live performances are supposedly even better then the CD itself. Those looking for the incredibly catchy and soothing Dave Matthews like musical experience should definitely check out this album.